The beginnings and endings of a speech are, of course, essential. But the transitions — how you get from one section or one idea to another — are equally important. And they are frequently overlooked. If you lose your audience at the start, you’re in trouble. So you’ve got to make good use of your opening words. Check out How to Start a Speech. The last few moments of your speech are, often, what your audience will remember most. So you don’t want to end with a whimper. Check out How to End a Speech. That said, transitions are equally important. And they are often overlooked. In some ways, I blame the misuse of PowerPoint for this lack of attention to transitions. PowerPoint allows you to create slides that are totally unrelated to each other. You can project one slide, talk about it, and say “next slide.” Nothing requires you to tell the audience how you got from the idea on one slide to the next idea. If you have to use a laser pointer, your slides are too complex. If you say, “next slide,” you’re not connecting your ideas; you’re presenting unorganized information, not a coherent idea. When you’re giving a more formal speech without using PowerPoint, you still need to tie things together. It’s fine to outline your speech and to present your speech from that outline, if and only if you explicitly explain how the points of your outline are connected. Transitions are the connective tissue of a speech. 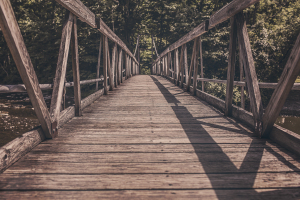 They are the bridge that leads your audience from one part of your speech to the next. Transitions show how the three to five main points of the speech’s body are connected. And transitions show how those main points lead inevitably to the speech’s conclusion. Transitions are one of the most important elements of any speech. Photo used by permission of RYAN MCGUIRE OF BELLS DESIGN at gratisography.com.